If you are anything like me, you have been captivated by the accomplishments of America’s latest space exploration program and the landing of the space ship ‘Curiosity’ on the surface of Mars. As a younger man, I worked on the Apollo moon landing program so it should be no surprise that I am a big supporter of America’s space program. Unless you are a ‘techie’, you probably have no idea how difficult it is to fly a spacecraft 350 million miles and land it safely on the surface of another planet – within the desired target the size of a basketball court. And, oh, by the way, Mars isn’t exactly a stationary target. It spins on it’s axis, just like Earth. Plus, it’s orbit around the Sun isn’t circular – it’s elliptical. At different times of the year, the orbit of Mars around the Sun – and thus it’s relative position to Earth – varies by some 15,500,000 miles. Yet the geeks at the Jet Propulsion Lab in California landed this mobile laboratory – the size of a P.T. Cruiser - on the surface of Mars, and within a few meters of it’s target. Now get this – it landed within 60 seconds of it’s programmed flight time, after a flight of 8 1/2 months!!! Try to shoot an arrow from New York and hit an apple on someone’s head in Honolulu, while they are riding in a open convertible, and you get an idea of the precision required by the flight of Curiosity. Why then, I must ask, with all this skill, is the Obama administration shutting down America’s space program? Perhaps a better question might be: “Why was the Curiosity program funded in the first place?” Relax dear readers for I have discovered the answer. Indeed, it is a true epiphany. (We geniuses have them from time to time). The Curiosity program is not about the exploration of space at all. It is about… America’s war on terror!! And, I have proof. 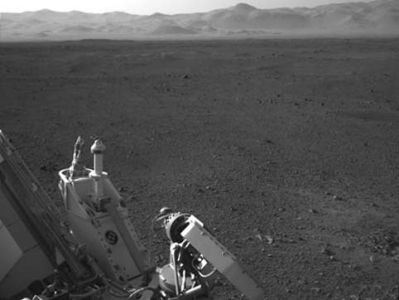 Take a look at the Mars photographs taken by Curiosity and tell me the place doesn’t look exactly like Afghanistan. Yes, Mars looks EXACTLY like Afghanistan. So much so that one has to wonder if there is not a secret Taliban training base up there someplace. My view is – and I am somewhat of an expert on space exploration – the real mission of Curiosity is to locate and destroy the Taliban encampments on Mars. In Afghanistan we do it with drones. But even the slowest liberal arts graduate knows that drones don’t have fuel tanks big enough to make it to Mars. Ergo – the mission of Curiosity. The ultra-sensitive cameras aboard the space craft have a database that is used to identify objects they photograph. For example, the camera photographs an object and compares it with a library of objects in the database. Identification of the photographed object is thus enabled and the appropriate action can be initialized. I have it on good authority that the database contains 127 versions of ‘goat tracks’. With the Islamic terrorists, you find a goat, you find yourself a Taliban. Taliban, of course do not keep goats for food. The Taliban keep goats for (how shall I put this in a politically correct manner?) “social purposes”. I have a friend that is a First Lieutenant in the Marine Corps, serving his second tour in Afghanistan. He wrote me a letter about six months ago and told me about a low-level Taliban leader that his platoon had captured. Apparently, the Marines had made up ‘wanted posters’ with the guy’s picture on them and offered a $1,000 reward to any local tribesman who helped capture him. Three days later, a tribesman walks into the Marines’s camp, handed the Lieutenant the poster and asked for the reward. The tribesman WAS the guy on the poster!! He actually asked for the reward for turning himself in. So, you see, you don’t have to be very fast – or very smart - to find the Taliban.